(C)2011 SONY PICTURES ENTERTAINMENT INC. ALL RIGHTS RESERVED. 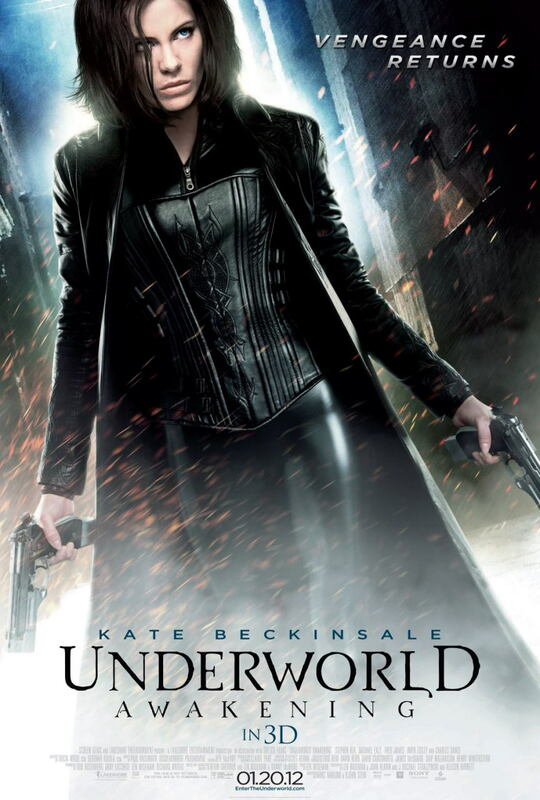 Six months after the events of Underworld: Evolution, Selene (Kate Beckinsale) is captured by humans during "The Purge," when she and Michael (Scott Speedman's stand-in) were planning on leaving the city. Eventually, both the government and the public learn about the existence of Vampires (Jesse Branden Dahl) and Lycans (Richard Cetrone, Dan Payne, DJ Miller). A crusade and all-out war begins: study and eradicate. After being imprisoned in cryogenic suspension for 12 years, Selene manages to escape the facility Antigen, headed by Dr. Jacob Lane (Stephen Rea), who is responsible for revealing the existences of both immortal races after his son's apparent death upon being discovered as a Lycan. During the same time, another subject has also escaped the same facility that Selene was in. After escaping, Selene sees mental flashes of someone else's point of view. Believing it to be Michael, she follows the flashes that lead her into a garbage chute. She confronts a young vampire named David (Theo James) who has been following her, when they realize that the Lycans live underground. Seeing flashes of Lycans hunting the person she is connected to, Selene eliminates many of them until the Lycans flee. Instead of Michael, she finds a young girl named Eve (India Eisley) - the other subject who escaped the facility. Eve has been taken care of by a female scientist working for Antigen named Lida (Sandrine Holt) since birth. After Selene and David get Eve out of the tunnels, they are chased through the busy city streets in a van by the three Lycans. They finally catch up to their van and break in while it is rushing through the city. Eve rips one Lycan's head in half while David and Selene shoot and stab the other two. On the way Selene realizes that Eve is not healing from a wound she suffered during her fight and is growing weak. David takes them to his coven. At the coven most of the vampires are less than thrilled that David brought the infamous Selene, the lover of a Lycan to their coven, especially his father, Thomas (Charles Dance); however, they agree to help the weakened child which they soon realize is weak due to her not feeding. After drinking some blood her wound heals and Selene, after seeing Eve's eyes change while feeding, sees that she has Michael's hybrid eyes and realizes she is her and Michael's daughter. Seeing that the coven does not want her there, she gets ready to leave. David, not wanting her to go, tries to convince her to stay and help them start an offensive against the humans by teaching them to fight. Before Selene decides, the coven comes under attack by Lycans who were thought to be almost extinct. Many of the vampires are slaughtered until Selene joins the fight. She orders David to take Eve to safety while she deals with the rest of the Lycans. Going to the main hall of the coven, Selene comes upon a massacre of mostly vampires with few Lycan corpses, then a giant "Super Lycan," more than twice the size of any werewolf she has ever seen. Fighting it with a silver bladed weapon, she breaks a piece off after stabbing it into its back. Selene is shocked to realize that the wound heals instantly and the silver had no effect. Unfortunately, Selene is no match for the giant Lycan and is knocked unconscious. She later awakens to find David's father gave Eve to the Lycans to save what was left of the Coven. During the battle, David is bitten by a Lycan and later dies after confirming Thomas' actions, who in turn blames Selene for all that happened. After David dies, Selene makes an incision in David's abdomen, then cuts the palm of her own hand and reaches into David's torso, grabbing hold of his heart. She squeezes it a few times, and with her Corvinus-enhanced blood, she restarts his heart, bringing him back to life. She then leaves to go get her daughter. Selene confronts a human detective named Sebastian (Michael Ealy) who confirms her suspicions about the Antigen corporation. After seeing the evidence, Selene realizes that the company is actually run by the Lycans, including Dr. Lane - who have been posing as humans in order to trick the world's governments into believing the Lycans are extinct and are working to eradicate the virus that created both races. Secretly, the Lycans intend to use Eve to perfect their race and develop an immunity to silver, thus allowing them to conquer both vampires and humans. The Super Lycan whom Selene had fought was Lane's son, Quint (Kris Holden-Ried), who faked his death after his werewolf status was discovered. Using Eve's genetics, Dr. Lane conducted experiments on his son to make him immune to silver, and in the process, vastly increased his size and power. Realizing the threat to both their races, Selene and Sebastian team up to attack Antigen and save Eve. After breaking into the building and killing the Lycan guards with silver gas grenades and silver bullets, Selene comes across Subject 0, who she discovers is Michael. Being short on time, she shoots the glass to weaken the containment unit in order to free Michael, then goes to stop the Lycans from leaving with Eve. Using her incredible strength, she flips the van with Eve and her captors inside, only then to come face to face with the Super Lycan, whilst Eve fights the Lycan Dr. Lane. Eventually Selene goes down a hallway where the Super Lycan cannot fit, forcing it to shift back to his human form, allowing Selene to impale Quint with her hand. When she withdraws her arm, Quint heals instantly which Selene is counting on. She then throws a grenade pin at him. Realizing too late that she has put a grenade inside him, Quint claws in vain at his stomach before it explodes, killing him. Meanwhile, Eve - with the help of Sebastian - defeats Dr. Lane and rips out his throat. Going back inside, they find that Michael's cryogenic tank is empty; Eve then gets a flash of the roof where they go, but Michael is no where in sight. Selene says that the world will hunt Michael just as they hunted Eve.